Let’s talk about Wednesday night TV! CHICAGO MED: I fully expected Dr. Charles to stop brushing Ethan’s real hand to prove his point about the fake, but nope, he hammered the prosthetic. It’s great they were able to work together to solve the patient’s scratching, though, because when she scratched straight through to her skull, I full-body cringed. Will and Natalie’s wedding is going to be a total mess, huh? RIVERDALE: How does Archie escaping make any sense? Not only will it add time to his sentence when he inevitably gets caught, but it also puts everyone he loves in danger. Why wouldn’t they go after his father (at the very least) as a way to get to him. Also, he can’t hide in Riverdale! 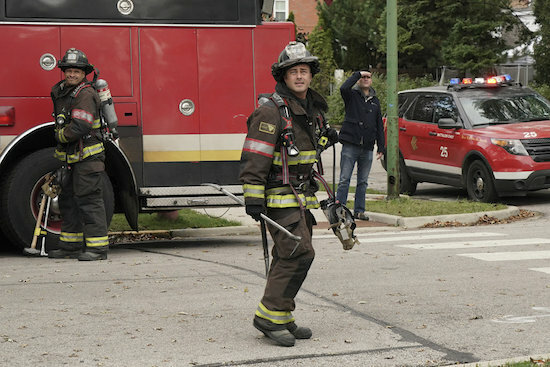 CHICAGO FIRE: I’m really, really, really, really glad they had Foster put the brakes on what could have been trouble with Severide. Had something developed, especially under the circumstance of them bonding over grief, it would have completely alienated her from the rest of the Firehouse. I’m curious how long Severide’s grief will impact his job. Like he acknowledged, he wasn’t right when he didn’t move when he was told to evacuate. Was it just this one major flare-up, or will this be an ongoing problem?